The credit card register in Quicken 2015 works like the regular register that you use for a bank account. You enter transactions in the rows of the register. After you record a charge, Quicken updates the credit card balance and the remaining credit limit (if you entered the optional credit limit information when you set up the account). Move the cursor to the Date field (if it isn’t already there) and type the date, using MM/DD format. You’d enter August 1, 2015, as 8/1, for example. You usually don’t have to type the year because Quicken retrieves the current year number from the little clock inside your computer. Or, if you want, get crazy: Click the box at the end of the field that remotely resembles a calendar, and Quicken displays a pop-up calendar from which you can select the appropriate month and day. Don’t bother with the Ref field (if you see it). Quicken optionally supplies this field so that you can record the credit card reference number — a bit of data that’s usually about 20 characters long. You, my friend, have better things to do with your time. Just skip the field. Record the name of the business you paid with a credit card. Move the cursor to the Payee field and type the name of the person or business you paid. If the restaurant is Florentia’s Cantina, for example, type Florentia’s Cantina in the Payee field. Move the cursor to the Memo field and type the specific reason you’re charging the item, such as a special date with your spouse or an important business meeting. The Memo field — just so you know — appears only when the register display is set to Two-Line Display mode. Move the cursor to the Category field, open the drop-down list box, and select the appropriate category. You may categorize a restaurant charge as Food & Dining:Restaurants, for example, if you’re using Quicken’s suggested categories and subcategories. If you’re using tags to classify the data even more granularly, move the cursor to the Tag field and select the tag you want to use for the transaction. Move the cursor to the Charge field and type the total charge amount — 30.57 in this example. Don’t type a dollar sign, but do type the period to indicate the decimal place and cents. Record the charge, and click the Save button. 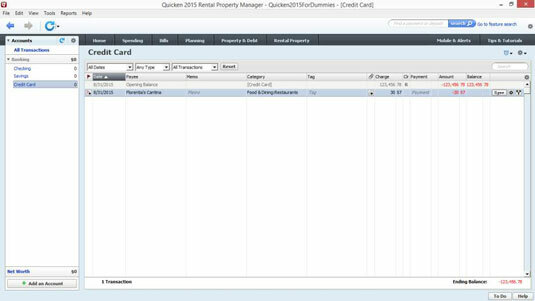 Quicken beeps, calculates both the new credit card balance and the remaining credit limit, and then moves the cursor to the next slot in the register. The figure shows the charge at Florentia’s. Good food and reasonable prices — you can’t ask for much more than that.